Paczki are traditionally eaten on Fat Thursday or Fat Tuesday. Roll fried donuts in granulated sugar, icing sugar or dip into a thin icing sugar glaze. These can be filled with jam or custard. Makes 12 paczki donuts. In a large bowl or the bowl of a stand mixer, dissolve yeast in the lukewarm milk and let stand for 5 minutes. Add 1 cup of the flour. Mix together and let stand for 20-30 minutes, until really bubbly. In the meantime, beat the yolks in a small bowl until they are light and fluffy. To the proofed yeast mixture, add the melted butter and sugar and mix. Add salt and vanilla. Add beaten egg yolks. Slowly add rest of the flour to bowl in 1/2 cup increments just until a very soft dough forms that is moist but not sticky. Meanwhile, heat oil to 360° Fry paczki until golden on one side, flip and fry the other side. Don't try to cook too many at a time so you don't reduce the temperature of the oil by adding too many at once. Don't rush the frying, to be sure they are cooked through well. Fry until they are a deep golden colour. 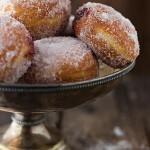 Remove paczki to a cooling rack for about 30 seconds, then immediately roll in granulated sugar. Let stand until completely cooled.